Showing results for tags 'effects'. I was wondering if anyone has used gel medium for making water effects and how it went? I'm making a diorama and need to do water effects but the base doesn't really allow for me to pour resin. I'm making a little stream and need to figure out the best way to do this. Or if there are any other easy ways to do water effects would also be appreciated. So. I used to be a mini painter back when I was a kid. I have been playing tabletop rpgs steadily for over 30 years, but haven't done minis for the last 20. I did, however, get my art degree and became a pro artist in the meanwhile, so I know some technae. 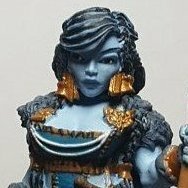 However, my understanding of mini painting is stuck at kid level, when I used acrylics but did not speak with anyone else or know the terminology or (to be honest) paint very well. Now I'm working as a beginner again, here to learn, but since I also have an art background I find myself wondering about certain aspects of mini painting. For example, why is dry brushing considered a quick and dirty method of highlighting? I understand it as a way to do some very subtle blending (on the macro scale, anyway). What would be the more careful version of painting that it is a substitute for? I also have questions about how people understand the terminology. For example, I've noticed regular use of the term "glaze," which seems to be understood as a wash of a darker color over a lighter one to increase its intensity or, especially in the case of minis, to bring out its texture. Mini painting seems to use only the wet sense of "glaze" (but then, to be fair, so do most fine artists). But "glaze" can also be used to mean dry brushing with a transparent darker color over a lighter one, which can generate some very interesting effects. I have not seen use of the counterpart to "glaze," which is "scumble." "Scumbling" is the same as "glazing," but using a lighter, semi-opaque color over a darker one. It's very good for pearly, moonlit effects and fog and atmospherics. Do people use this technique? And if so, what do they call it? I'm sure I'll think of other questions as I go along, but that's it for starters.